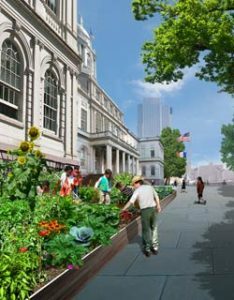 We, the undersigned people of New York City, respectfully request that a vegetable garden be planted in front of City Hall. This garden will represent New Yorkers’ commitment to education, public service, healthy eating, and environmental stewardship. This garden will be tended by NYC public school students, in collaboration with the NYC Department of Parks & Recreation and our region’s talented gardeners and farmers. The harvest will be donated to a nearby food pantry to feed the hungry. This garden will represent the vision of a more sustainable, livable City for all New Yorkers, and will contribute to achieving the intents of PLANYC by 2030.